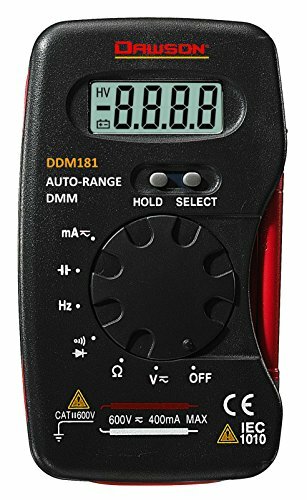 This Dawson DDM181 compact autorange digital multimeter is designed to measure AC and DC voltage, AC and DC current, frequency, capacitance, resistance, diode and Audible Continuity checks. It is low profile and lightweight with test leads wound on its body, making it easy to carry. It is ideal for electronic and appliance repair, home or commercial use. This instrument will provide years of satisfactory service.